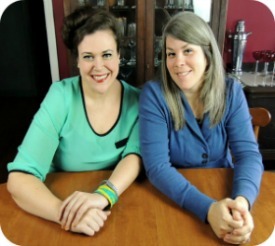 Back in the early archives of Fun Things To Do While You’re Waiting, you will find a post Coralie (my co-blogger) wrote titled, “Pack Your Bags! What to Take to the Hospital.” In the post, you will find a list of practical items to bring (as advertised) but, the post is also a really lovely, honest story of Coralie’s experience bringing Baby Bubs into the world. Hospital stays are definitely not a fun thing to do, though there is a lot of waiting. But, it is a hard fact that, for most of us, there will be times during our lives spent in hospitals. Some visits are joyous. Some are tedious. Some are heartbreaking. All of them exhausting and difficult. I hope you or your loved ones never encounter a medical problem in your life that necessitates long-term hospital care. That is if you are lucky enough to receive care at all… my prayers for those less fortunate. But, between the barrage of confusing paperwork, terminology, and a never-ending rotation of staff, hospital life is an exercise in patience, fear, and fatigue. Although hospitals attempt to make your stay as recuperative and comfortable as they can, there is a reason why people don’t want to live there permanently. 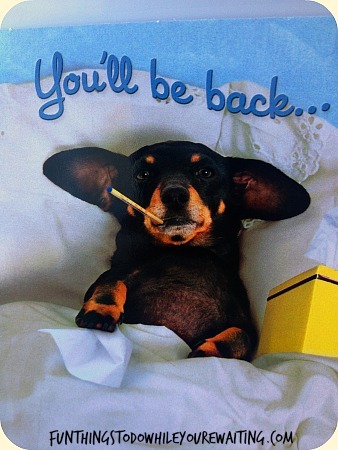 Adorable dog greeting cards are always restorative. As many of you know, my awesome, 22-year-old brother (Russell) has been fighting leukemia since September. As a family we have fought the battle with him– trying to reason with the enormity of the situation. The past year for him and our family have been all about long-term stays at the hospital. But the blessing of experience means we get better and smarter every time we’re back in the fray. I compiled a list of crucial items and tips we’ve gleaned for those navigating the choppy waters of hospitalization from someone who has been there. It is a list for patients, care givers, and anyone else who knows someone in the hospital long-term and wants to know how to help. A patient’s hospital room is designed for the patient, and less so for the caregivers/family of the patient. If you are lucky enough to have your own room, it is generally large enough to sleep one patient abed with a chair/sofa for the one allowed caregiver. One of the first orders of business (after being admitted, of course) is to find/talk to the hospital’s help/information desk. The information desk is the place where you will find answers to some of the most crucial items on your hospitalization to-do list: lodgings, parking, and food. HOTELS/LODGINGS: Unless you live near the hospital (which you may not depending on your treatment), finding somewhere clean, nearby, safe and affordable where family can stay is at the top of your list of priorities. The hospital information desk will have a list of local hotels who contract at lower rates for families of long-term patients. Hopefully, a friend or relative will have a room, but many hotels/motels close to the hospital are equip to handle the schedule of a patient’s family. As hotel bills can add up as fast as hospital bills, depending upon the patient’s age or length of treatment for illness, there are also many organizations dedicated to housing the family of long-term care patients. If the patient is under 21, for example, a “service worker” (one of the many people you encounter during your first days at the hospital) can recommend you to one of these organizations. PARKING: Mastering the in’s and out’s of your long-term and visitor parking situation will do much to make your life less stressful. Visitors will want to know where to park and you will want to know you got the cheapest, closest, safest parking around. The hospital information desk is, again, the spot for information on long-term passes, visitor parking, or valet. SPREADING THE WORD: Keeping in touch with the outside world is important for patients and caregivers in the hospital. It is also dire for loved ones far away. Keeping in touch with everyone is harder than you think between procedures, endless vitals checks, and trying to catch up on sleep. Responding individually to all interested parties can become overwhelming quickly. Setting up an account through an intermediary site such as caringbridge.org or using Facebook to update all interested parties is highly recommended. If even that is too much, ask a trusted family member who is in the loop. The hospital’s job is to care for and feed a patient. Not their caregivers and friends. And, although a patient is provided three meals a day, caregiver’s are often left to fend for themselves. Although there is always a cafeteria, the hours may be variable and are often not accommodating to night owls. Familiarize yourself with all hospital and local, walkable options. Another thing to ask the hospital information desk is for their list of local restaurants that deliver. If you are chummy with the nurses, ask them from where THEY order. Your food world is NOT limited to the cafeteria. There are, of course, vending machines with many of them accepting credit cards (though quarters and dollar bills, as Coralie also suggested, are always a good thing). No matter the situation, sick/hospitalized or well/healthy, staying hydrated is KEY. Nowhere is it more key than in hospitals. Again, the job of the nurses and staff are to care for and feed the patient. Their job isn’t necessarily to care for and feed their patient’s families and friends. Caretakers need to stay hydrated. And when nurses are busy, patients also need to stay hydrated with the help of their caregiver. 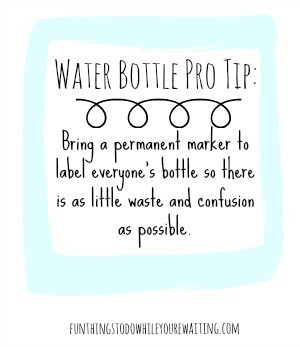 Cases of bottled water (or Gatorade) can be stashed anywhere in the room and have a long shelf life. It also makes another thoughtful gift. Like water, snacks and food are also good things to have on hand for a long term stay. There is generally a microwave, an ice maker, a refrigerator, and hot water machine available to patients and caregivers. Locate where this is and get creative with your arsenal of ingredients. Or, avoid the vending machines all together by going to the nearest grocery store and stocking up on relatively shelf-stable or frozen items for patient, caregiver, or guests (at much lower prices). Personal suggestions are hot tea varietals, hot chocolate (basically any warm, meditative liquid), soups, and Amy’s Frozen Pesto Tortellini. While at a grocery store, don’t forget to pick up some paper plates, napkins, cups, and cutlery to have on hand for food delivery and the sharing of food from thoughtful friends. When Russell was first hospitalized, it was during Halloween. Our Grandmama brought a plastic Jack-O-Lantern full of fun-sized Halloween candy. Our room became THE. SPOT. The candy was a hit. We made friends with nurses, technicians, doctors, and staff and everyone LOVED to come to our room. Having special snacks and treats for the nurses and staff is a thoughtful gesture towards the team of people taking care of you or your loved one. One caveat though: include some smarter, healthier snacks to promote the health of your team. And be wary of food restrictions and germ protocol. Make sure to carefully pack all essential electronics (phone, computer, tablet, headphones, etc.) and their respective chargers. Don’t forget the alcohol wipes/Lysol to keep them all disinfected- those things get grimy fast. Inquire about the hospital’s internet wireless, tout suite. My Dad’s blood pressure pill. 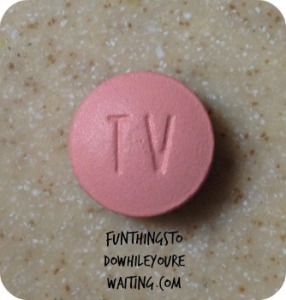 Or, as I like to think of it, a TV pill. Now that you’ve packed all your electronics, I wanted to suggest a few items and apps that are needed. Make sure to have Netflix/Hulu/HBO GO/or any other streaming service accounts/apps installed on all devices. Every hospital I have ever encountered has dubious television channel packages. There will be much time to pass so having the ability to access “your shows” when you want is important. Having fun/interesting distractions around is almost tantamount to medicine for having a better stay in a hospital. Books and movies are, of course, the gold standard when it comes to passing the time at the hospital. Books and movies take up space though, so you will want to limit your collection of both. Most long-term wings have lending libraries of books and DVDs. A Kindle from Amazon (or any electronic book reading platform) is a super nice things to have. It lessens the amount of books you need to carry and the backlight option is great for late night use without disturbing anyone. Hey! 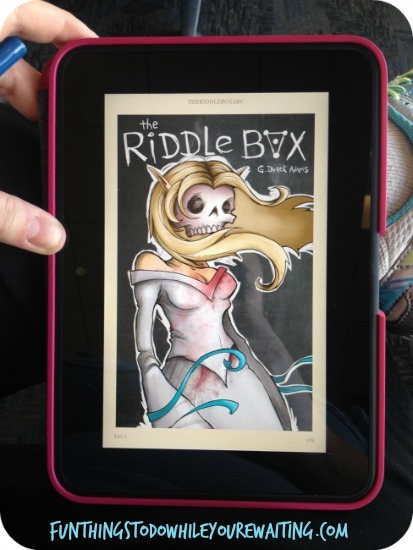 Doesn’t my friend Derek’s new book for sale here look great on my Kindle? Though may I make one small suggestion about avoiding certain internet things– although it is important to stay informed and educate yourself as a patient and caregiver let me recommend not falling down certain internet rabbit-holes. My brothers doctor mentioned something great about it, once saying, “if someone is staying home complaining on the internet then they are not out enjoying life. Be wary of opinions from those people.” Yes, I understand the irony of me typing this and pointing that out, but I just to suggest that you limit your internet research of your disease to reputable sources. 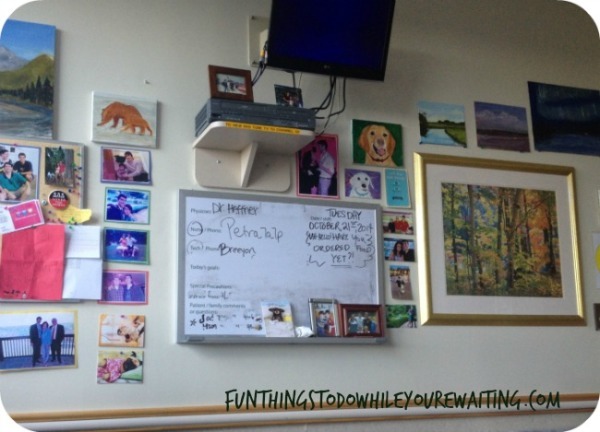 It is always a good thing to bring a few pictures and art in to populate the walls of the hospital room with love and positivity. Command brand removable adhesive strips are great as they are strong enough to hold up a photo but you don’t damage the walls. Along with personal photos, posters of art (no matter the kind) are good distractors and sources of conversation. Posters and adhesives are another fun gift idea! Coralie mentioned pillows in her What To Take to the Hospital article, and I want to reiterate it and add an addendum. Not only should you bring pillows and desired bedding pieces (blanket, sheet, etc.) but you should also bring a bag in which to store them when not in use. Bring any item that eases and facilitates sleep for patients and caregivers but make sure you have somewhere to put them out of the way to avoid clutter during the day. A college dorm staple, foam, egg crate mattress toppers cost around $20 at can be found at most Target/Wal-Mart/Bed, Bath &Beyond stores. A large majority of the patient’s time is going to, sadly, be spent on their hospital room’s mattress. Most hospital mattresses are twin-sized, plastic pads. The added comfort of a mattress topper to this equation is sizable. Additionally, the egg-crate is breathable, unlike the plastic mattress… and when you are having hot flashes or fevers, this becomes a thing. If your stay is longer than 3 nights, an egg-crate mattress topper is an essential luxury to the comfort of a patient with many long-range health benefits. It is also a thoughtful gift, for those looking to help. Speaking of facilitating sleep (and electronics to pass the time pleasantly) another item I found to be super is to have a white noise maker. Either bring your own machine or download an app for your phone. A White Noise maker is a literal and aural distraction and one of the most important things to have to drown out never-ceasing hospital noise. My favorite is TMSoft’s White Noise App. The hospital provides basic toiletries for the patient. But, if you are at all picky about specific preferences for toothpaste or eye cream, definitely bring your own from home- in travel sizes if you can swing it. 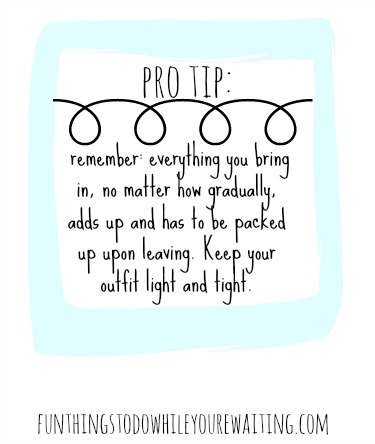 Like the bedding items, find a bag and a way to keep all your things together but easily storable. I would suggest though bringing a good, gentle non-smelly body/hand lotion. The air is so dry in the hospital, that a good lotion is a thing of beauty. Also a great gift idea! Depending on treatment, patients may be wearing hospital provided gowns or their own clothing. Check with your doctor to see if there are any clothing restrictions before packing. Generally, the softer and more comfortable the clothing, the better. You will need slip-on-shoes, or bedroom slippers. Having easily removable shoes for patients and caregivers do much for the comfort level of all guests. Also, bring laundry detergent, as the wing where you are staying more than likely has a laundry room. Positive energy, from family and friends, through cards, visits, and gifts are great morale boosters for patients and families facing long-term hospitalization. Make sure to co-ordinate with the patient or family as to when you are able to visit or how you would like to help. Find out, as best you can, what the mailing address for the patient is, and what the visitation/parking policies are for them. Find out if there are any dietary, clothing, or environmental restrictions for the patient. Russell, for example, was not allowed to have plants or flowers in his room. Avoid duplicates. 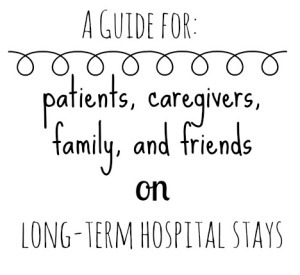 It is difficult to know what to do to support a family and patient during long-term hospitalization. And although they may need a million things, chances are they are too tired to remember what they need if/when you ask. Food is always a good idea. Whether it is for family members at home, or in the hospital, someone needs food. Don’t stress too much about WHAT to get or make them. Bring something you love, or that comforts you, and share it with them. 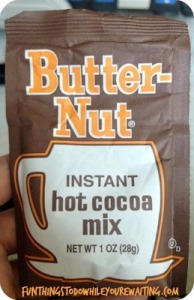 Chances are (so long as it is not too far out there) someone in the patient’s life will love it. Also, consider buying pizza, lunch, or dinner from your favorite restaurant nearby for the patient and family. Another idea is to bring food/snacks for the doctors, nurses, techs, and staff of the section looking after your loved one on their behalf. Help at home: does your friend or loved one have plants at home, or dogs? Getting mail, mowing lawns, or helping with the general upkeep of loved one’s home outside of the hospital is a generous gift. Regardless of your offering, it will be appreciated. And don’t be offended if a ‘thank you’ note or mention is late. As long as it is from the heart, it can’t go wrong. A million thanks go to my family, our friends and the doctors, nurses, and staff who have cared for Russell. Thank you to those who have shared the story of their fight with us. Your survival shines a light at the end of a path for those wandering in the dark. Do you have any suggestions about crucial things to know before embarking upon a long-term hospital stay? 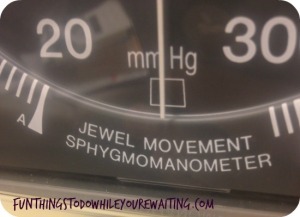 Do you know what a sphygmomanometer does? Do you think coloring is therapeutic? As always, let us know in the comments! Love it. I think this is very insightful. It’s something you don’t really think about until you’re packing your bag to go to the hospital.